Bullying occurs when a person or a group repeatedly and intentionally use or abuse their power to intimidate, hurt, oppress or damage someone else. Bullying isn’t a single incident but sustained or systematic activities. Bullying can be inflicted upon children, young people and adults at any time of their life. Some experts suggest that bullying can happen to as many as one in five children or young people and more likely to occur during the schooling years. Unfortunately, children with disabilities are more likely than their peers to encounter bullying. Bullying can have serious consequences for children subjected to it. Victims of bullying are more likely to suffer from a range of issues which may include anxiety, low self-esteem and depression. Some parents also report feeling angry, helpless and frustrated if they discover that their child has been subjected to bullying. There are different types of bullying – physical, verbal, social, psychological and cyber – used for the purpose of intentionally hurting or intimidating another person. Physical bullying can include hitting, kicking, tripping or poking another person or intentionally damaging someone else’s belongings. Verbal bullying can include the use of negative words such as name calling, insults or slurs. Social bullying can include the spreading of lies, rumours, social exclusion or conducting undesirable pranks. Psychological bullying can include the intentional use of words or actions (eg. stalking, intimidation and manipulation) that can cause psychological harm. Cyber bullying relies on the use of technology to verbally, socially or psychologically bully another person. It is a newer type of bullying that can occur through use of networking sites, mobile phones, cameras, emails or internet chat-rooms. Cyber bullying can include sending hurtful text messages, sending nasty or hurtful messages on networking sites (eg. Facebook, Twitter or internet forums), sending photos and videos of the victim to others, spreading rumours via emails or networking sites, theft of passwords to enter into a victim’s account and changing information, and setting up a fake profile of the victim for the purpose of posting messages or status updates. Children and young people may sometimes find it hard to tell parents if they are being bullied and some children may not exhibit any warning signs. 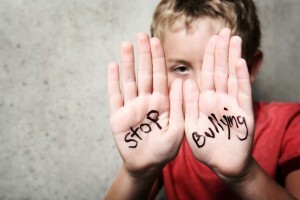 Sometimes children feel ashamed, embarrassed or too threatened by the bully to tell anyone that bullying is occurring. Displays unusual treatment towards other children (such as controlling / dominant behaviours and lack of empathy towards other children being bullied). If you become aware that your child is being bullied (regardless of the type of bullying) there are a number of ways you can assist your child. The most important being that you take your child’s bullying seriously, let him or her know you are there to help, reassure that the bullying is not their fault and that you will take action to prevent any further bullying. Stay calm, positive and listen to your child. Listen to your child’s experience and focus on identifying a solution with your child. Ensure that your child understands he or she is not responsible for the bullying. Remain calm, positive and confident as this will reflect on your child and reinforce that the situation can be addressed appropriately. Discuss strategies with your child. Discuss short-term strategies with your child to see if he or she can resolve the bullying themself. Encourage your child to: walk away; appear unimpressed; say “no” firmly; or, speak to another adult (such as a teacher). If the bullying continues speak to staff at your child’s kindergarten, pre-school or school. Do not advise your child to fight with the bully. It is important that you do not advise your child engage in fighting with the bully. This can be a dangerous and inappropriate approach. This can exacerbate the situation and your child may be reported for engaging in a physical fight. Discuss the bullying with your child’s school. Your child’s teacher or school may not be aware that any bullying is occurring, particularly if it is happening outside of the school environment or online. Let your child know that you are planning on discussing the bullying with school staff and remind him or her that the school is there to support. All schools are required to have a bullying policy and when you meet with the school you may want to ask what the policies are and how they will handle your individual situation. Instil confidence and pride in your child. A child that has been bullied can be at greater risk of being bullied again in the future (even if the bullying has been addressed). A child that has been bullied may also lose personal confidence and pride. To assist in restoring it, encourage your child to spend time with other children that are a positive influence. You may also want to encourage your child to participate in sports, clubs or groups that build personal strength and peer friendships. Foster a positive home environment and allow your child to talk about their limb difference, particularly if their limb difference was part of the reason that the bullying took place. Remind your child that we are all different and reinforce that he or she has many abilities and skills. Seek professional support. If you find that the bullying has deeply affected you or your child you may want to consider seeking external professional support. Consider speaking with your GP, a Social Worker, or a Psychologist.